• Emphasizes the combination of studio arts process with liberal arts learning. • Students form a coherent critical platform and an arts management process by which to present their work. • Integrated apprenticeship courses in studio art education models. The Marchutz School of Fine Arts offers a two-year MFA degree program with a concentration in Painting or Sculpture. The curriculum combines studio practice with liberal arts investigation, critical analysis, museum study, field study, and the flexibility of low-residency during the second year. 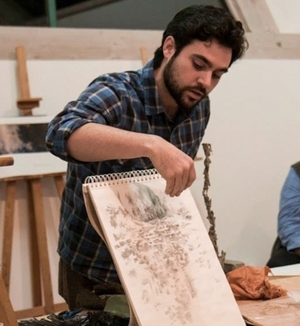 The 60-credit program, conducted in English, in Aix-en-Provence, France, culminates in a Thesis Project which includes a public presentation of an original body of artwork. During the second-year, candidates may complete the program in Aix-en-Provence, or take advantage of the program's low-residency option to work off-campus. Thesis work can be completed in specific partner locations like Paris, Giverny, New York, Barcelona, and Morocco, or, with approved artist teachers, students may work from their home region through a low-residency format. The Marchutz School is uniquely situated to give students the means to delve into the minds and works of some of the most renowned masters of painting and sculpture within the European heritage and discover the cross cultural influences of the Mediterranean Basin. With its museums, galleries, and newly-minted arts center, and its proximity to Marseilles, Aix-en-Provence is an ideal location for MFA candidates to pursue graduate study in a professional setting surrounded by the arts. MFA Thesis exhibitions prepare candidates for future careers and also bring new and informative work to the community at large. "What we need is a school of vision." "A new paradigm of thinking involves a significant shift from objects to relationships, the rooting of a vision in the ground of our needs; the need for openness, the need for contact, the need for wholeness." "I started by painting and then I made sculptures... The one helps me with the other - besides, the two are both drawing and drawing helps me see."